I will make some more laser engraved litho,s when I can – now that we have solved the filler powder problem. Interesting thing is that Plexiglas just ‘hisses’ when cut with the laser whereas Corian makes a lot of ‘noise’ (and ‘sparks’) – great fun to watch. If you need Corian let me know as I work with the material in my shop and might be able to get you some. Send me a a PM and I will send you my e-mail or just e-mail me if that is displayed here. Thank you for the kind offer - I may take you up on that when I need some more. By the way the reason it sparks is due to the mineral that is used to fill ( add density) to the plastic that is Corian. Let's just say that Corian is NOT microwave safe. Let's just say that Corian is NOT microwave safe. Thanks for the info Michael. It will probably be a while before I get back to using Corian but it certainly is a nice material to work with. Probably the most photographed building in Hungary. It's symmetry is just outstanding. 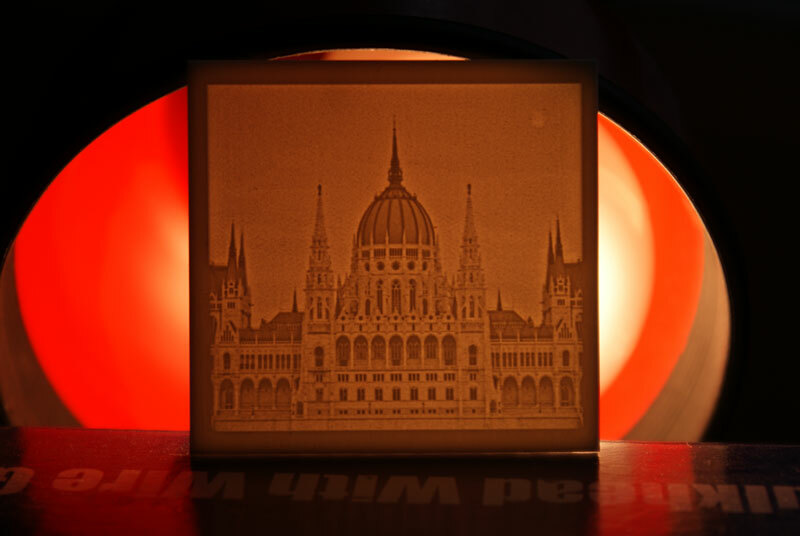 This laser produced rendering is just 50mm square and I think, makes for a good example of the detail that can be reproduced within a lithophane. Great! Is is possible you might be able to patent your method of producing lithophanes with a laser? Certainly seems it might qualify for one. As far as I am aware there is nothing new or creative about this process and others have probably already been there before me anyways. (Patents are probably best left to the big business’s that need to protect their investment - I am just happy to share any information which, hopefully, will help others to go on and do better things). This was just a standard JPG image which I cropped to make it rectangular then using the Mach3 Laser / Impact plugin I scaled it to fit the 50mm x 50mm blank. Set the max. laser power to approx. 30% and hit Cycle Start. By the time I had finished off a can of beer it was done. Nice work and good the choice of theme. Any special brand of beer to get the great results you get? Maybe I'm drinking the wrong brand.